Located on the edge of Regard-sur-le-Fleuve Park in Sorel-Tracy, the Biophare offers a spectacular view over the majestic St. Lawrence. From the top of the promontory it stands on, visitors can observe an abundance of birds and watch immense oceangoing ships as they sail along the St. Lawrence Seaway. The architecture of the museum, which is dedicated to the Lake Saint-Pierre biosphere reserve, is inspired by the historic lighthouses typical to this area. The museum protects the region's heritage and guides visitors as they discover its unique natural environment. The Corporation soreloise du patrimoine régional, a non-profit organization, manages the museum and organizes its activities. Marc Mineau has been director of the Biophare since its creation. 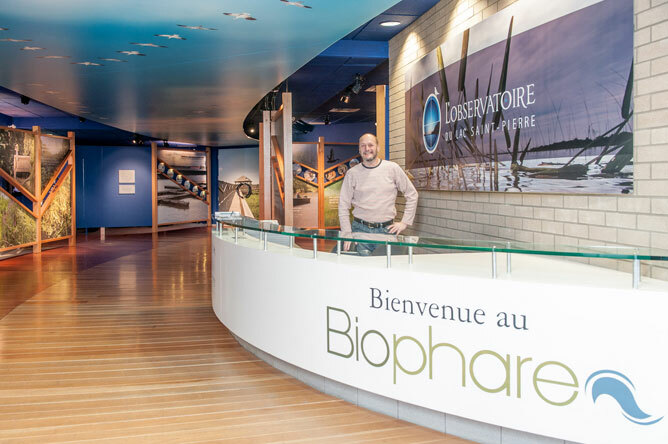 The Biophare opened in 1995 under the name of Centre d'interprétation du patrimoine de Sorel. 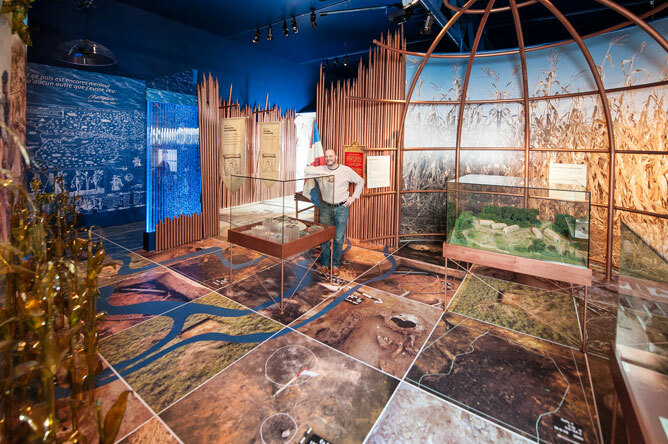 In 2009, it launched its second permanent exhibit, "L'observatoire du lac Saint-Pierre," which replaced the earlier exhibit called "Un pays entre terre et eau." The institution changed its name to give a more accurate idea of its activities, which are aligned with Lake Saint-Pierre's recognition as a UNESCO biosphere reserve in 2000. In fact, from that time on, the museum's activities have focused on highlighting the features of the biosphere reserve. The Biophare is managed by the Corporation soreloise du patrimoine régional, whose mission is to protect, document, interpret, highlight and promote the heritage of the Sorel-Tracy region, the Pierre-De Saurel regional county municipality and the Lake Saint-Pierre biosphere reserve. It fulfils its mission by managing and promoting the Biophare; creating and presenting exhibits; developing cultural and educational activities; collecting and preserving documents, artifacts and accounts; and creating publications and audiovisual presentations. 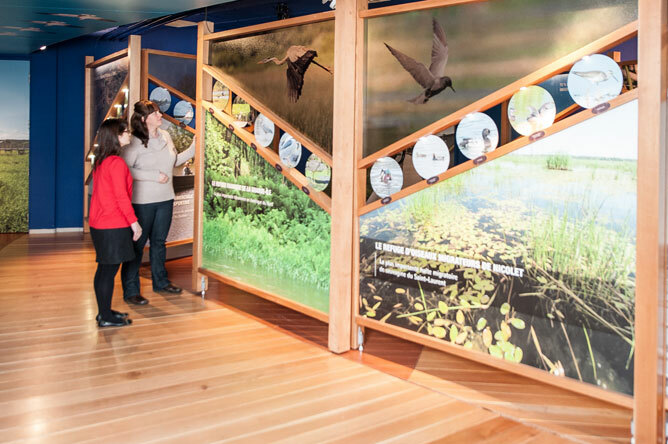 Visitors to the section of the permanent exhibit that highlights key features of the Lake Saint-Pierre biosphere reserve. The Biophare presents activities that highlight the natural and cultural heritage of the region, with a focus on major historical periods and events: pre-contact St. Lawrence Iroquoians culture (500 years ago), the voyages of Cartier (1535) and Champlain (1603-1609-1610), the construction of Fort Richelieu (1642), the foundation of the Seigneury of Pierre de Saurel (1672), settlement by Loyalists and Germans during the American War of Independence (1775-1781) and the major industrial activities of the 20th and 21st centuries. The Biophare's exhibits show how humans have found ways to live in harmony with this natural environment and the major seasonal changes it undergoes. The history and culture of the region have been deeply affected by its distinctive natural features. Throughout history, the region's natural resources have made it a very attractive location and given it high strategic value. 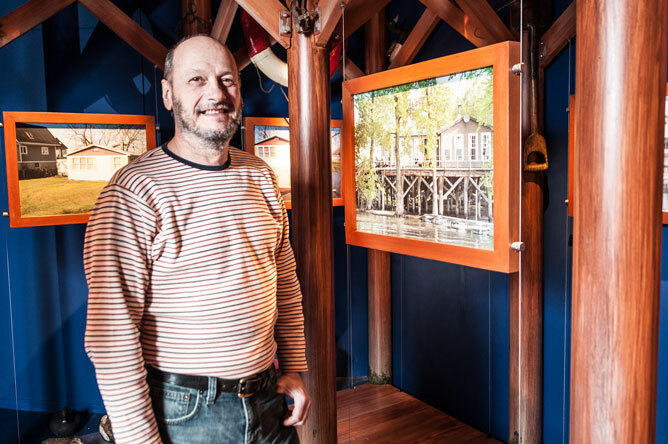 Marc Mineau, director of the Biophare, in the section of the permanent exhibit that presents spring flooding, cabins on stilts and life in the Lake Saint-Pierre archipelago. A large, realistic model of the Lake Saint-Pierre biosphere reserve has been installed in the centre of the exhibit. Visitors can see the territory protected by the reserve at a glance, as if they were flying over it. Markers have been placed around the model to highlight various important features and landmarks of the region, and visitors can press buttons to turn on lights that point out the location of each element on the model. The "L'observatoire du lac Saint-Pierre" exhibit focuses on the vital importance of water in the history and ecology of the region. Lighting effects that evoke reflections and transparency, curved panels and sinuous pathways are used throughout the exhibit to reinforce the omnipresence of water. Large backlit photographs showing the various landscapes of the archipelago have been placed on glass, canvas and vinyl surfaces to accentuate the appearance of fluidity, which is a distinguishing feature of aquatic environments. 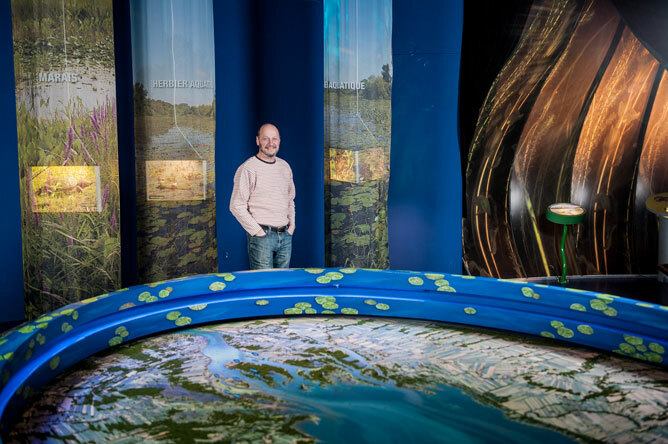 Marc Mineau, director of the Biophare, stands in front of the model in the section of the permanent exhibit that presents wetland environments. To display underwater life, two large aquariums have been set up at the end of the exhibit. These aquariums give visitors a chance to get a close look at a few of the species of fish that live in Lake Saint-Pierre. 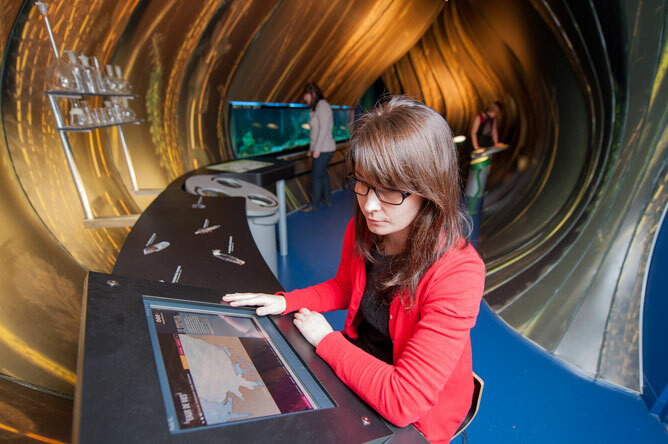 A touchscreen monitor allows visitors to access the " Waters of Life " virtual exhibit, which presents hard-to-see fauna and flora filmed underwater and through microscopes in the lab. This allows visitors to discover the tiny organisms (plankton and benthos) at the base of the food chain and hear top researchers discuss the various factors that threaten their survival. Various interviews with specialists in the fields of environmental science, sustainable development, agriculture and history are presented along the " L'observatoire du lac Saint-Pierre " circuit, allowing visitors to put a human face to the various issues addressed and bringing those issues closer to home. The Biophare helps visitors discover the features of wetland environments and the essential role they play in maintaining biodiversity, providing habitat for endangered species and improving water quality in the river. By raising awareness of the beautiful, rich, and fragile ecosystem of the archipelago, with its hundreds of islands and lush marshes and swamps, the Biophare also acts as a guardian of the Lake Saint-Pierre biosphere reserve. For more information: Virtual exhibit "Waters of Life"